Listening :: to the early morning calls of magpies and kookaburras. Anticipating :: my trip to Melbourne this weekend to teach at Amitie – I’ve wanted to visit the store for so long and can’t wait to get there! Sprinkle the salmon fillet with some salt and pepper and bake in a 200C oven around eight minutes (120gms per piece) or cook on the BBQ. Honestly, this piece is a little overcooked, I prefer it slightly on the rare side but just cook it to your liking. – one apple (granny smith or pink lady), matchstick sliced (it really is worth the effort to make it super fine, if it’s chunky, it just doesn’t work). – you can add some fresh parsley leaves or other herbs, I just plain forgot tonight but parsley and mint is really yummy here. Mix the salad very gently to scoop up all that dressing and coat all the bits but don’t be rough as the avocado will mush. Serve. Eat. Feel virtuous for having a simple and delicious meal. Then sit and drink a full glass of Bailey’s on ice to counteract the smugness. You’re welcome! 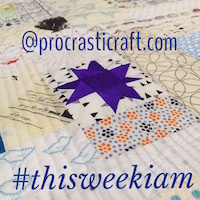 This entry was posted in #thisweekiam, family dinner, harvest, quilt, quiltcon, quilted, quilting, recipe, this week I am and tagged handiquilter, procrasticraft, quilt, quiltblockstohealviolence, quiltcon, quilted, Quilting, recipe on November 25, 2015 by procrasticraft.